Video shows a Campbell police officer pointing his gun at a passenger during a traffic stop. A viral video has Campbell police trying to explain the actions of one of their motorcycle officers. 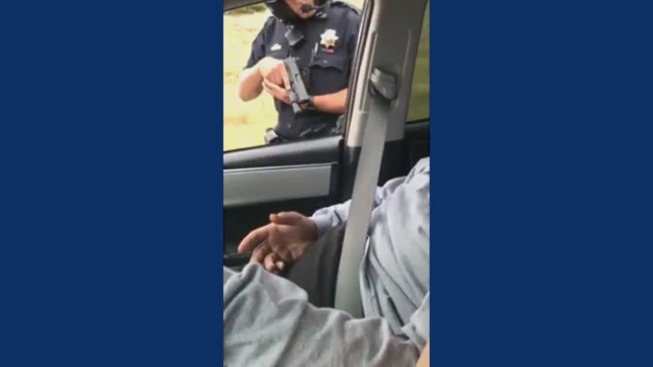 The video posted on Facebook shows a police stop on Highway 101, where the officer kept his gun pointed at a car's passenger for more than five minutes. The passenger repeatedly shows him he has no weapon and berates the officer for pointing a gun at an unarmed man. Police said the driver was pulled over for going 85 miles per hour. Police claim after the two in the car provided requested paperwork and the officer was walking back to his bike, the routine stop turned into a threat. The officer said the passenger reached under his seat, which prompted him to draw his gun. Campbell police said the exchange lasted nine minutes because back up officers were not close by and may have been delayed by heavy traffic. Until back up arrives, officers are taught to keep their weapons drawn in threatening situation. "It was out of the ordinary for the passenger to reach down there," said. "And based on training, the officer made the decision to pull out his gun and wait for back up. Critics note that the incident happened on northbound 101 near the Bailey exit and outside of the officer's usual jurisdiction. Several police watch dog groups said the video clearly shows an officer in the wrong, adding there was no clear reason to use such aggressive tactics for so long. Campbell police have reviewed the officer's bodycam footage, which they said provides a much clearer story. Police refused to release the officer's bodycam footage on Tuesday. Ultimately, no one was injured in the confrontation and the driver and passenger were released with a speeding citation. NBC Bay Area on Tuesday was unable to reach the person who posted the video to Facebook.